walks but as I inexorably progress to the end it strikes me that a.) there are not many multi-Nuttall days remaining and b.) 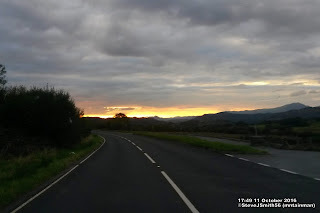 it is not very efficient as with the shortening days, without a really early start I am not going to manage all of the hills over two walks in one day. That decided all I had to do was link the two summits Manod Mawr and it's northerly namesake Manod Mawr North Top. The problem being the Graig-Ddu and Manod Quarries in between the two summits. Graig-Ddu gradually eating its way into the south slopes of Manod Mawr North Top. Judging by the size of Graig-Ddu it looks like 1/3 of the mountain has been removed over the years so one of these days it may be possible the summit may be devoured. I hope not. Pretty much a standard days walking in as much as the walked route was close to the planned route. A little difficulty finding the start of the path to the north of Manod Bach, a steep and interesting descent to Llyn y Manod then the diagonal ascent up the west side of Manod Mawr taking care not to follow it too far north. 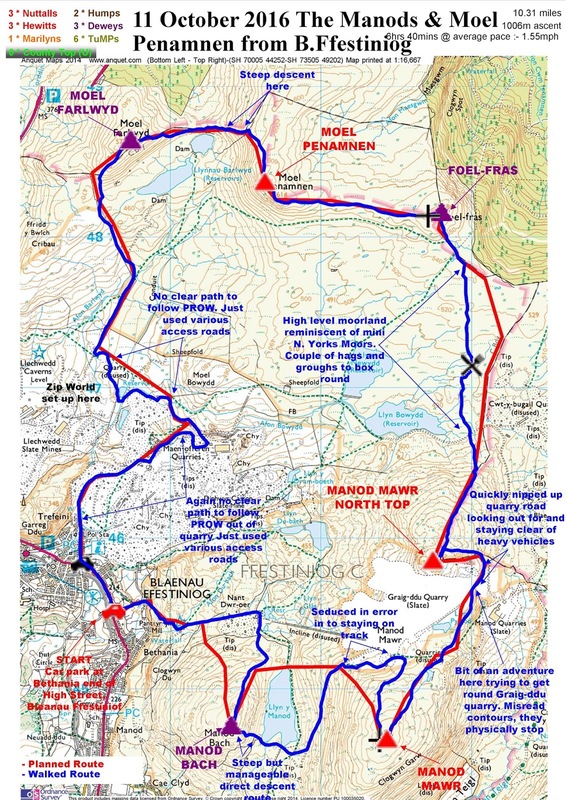 The expected problem to find a route between Manod Mawr and it's North Top had it's difficulties though not too bad, managing to find a short cut along the access road between the two quarries. Between Manod Mawr North Top and Foel-fras is a high level moor reminiscent of a mini version of the N. Yorks Moors, with just a couple of hags and groughs to box round, followed by a steep ascent up the final Nuttall of the day up Moel Penamnen. An even steeper descent to Llynnau Barlwyd reservoir brought me to the final ascent up Moel Farlwyd.The day finished as it began with difficulties finding the PROW on the ground through dis-used quarries but again not too bad. All in all a satisfying day.